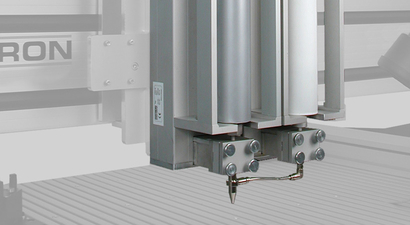 With the iVD2 combination dispenser a direct manufacturing and application of conductive sealing heads is possible. Perfected control engineering allows the wall thickness and material conditions to be precisely set. In the range of 0.8 mm to 5 mm bead diameter, there is no process for "form in place" shielding that is more efficient. EMI seals are extraordinarily efficient and especially soft after the "coextrusion process". Hereby, a soft core made of silicone is encapsulated with the conductive EMI material. This leads to cost-effective production and much softer beads than with conventional methods. This procedure can also be used for other combinations of materials.